We recommend arriving at least 1.5-2 hours before your event to allow for travel time. Download a copy of this page in PDF format. 20-45 min to downtown, 30-60 min to Bellevue. Airport to downtown: Metered, about $42-50. Downtown to airport: $40 flat rate. “Ground Transportation” touch screen at baggage claim. Allow for an hour to get downtown. 1-way ticket $2.25-3. 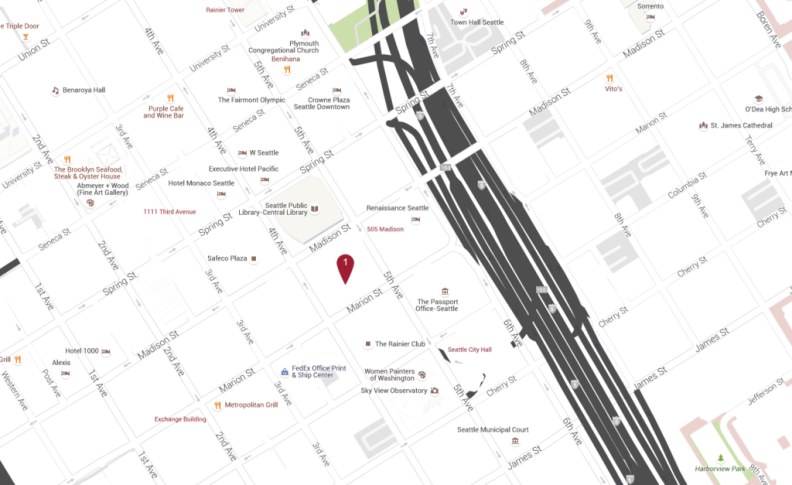 To get to WSU Downtown Seattle, take the Link to Pioneer Square Station, exit towards James St, turn right on James St, left on 4th, walk 3 blocks to Marion St, and 901 5th is on the right. If driving, plan $20-35/day in parking. Uber, Lyft, Sidecar: Download one of the apps, schedule a ride for trips between meetings. Visit metro.kingcounty.gov and click “Plan a Trip”. Download the “One Bus Away” App. The South Lake Union Streetcar runs from Lake Union to Westlake, and the First Hill Streetcar runs from Capitol Hill to Pioneer Square. 1-way ticket $2.25. Traffic varies based on time of day, so always check travel time to your event or meeting. Generally traffic flowing into the city is more challenging in the mornings, and out of the city is difficult towards the end of the work day. Thursdays are almost always high-traffic days. Visit wsdot.wa.gov or download WSDOT for traffic updates, or follow on Twitter @WSDOT. 520 Bridge fee: $3-$5.40 depending on time of day (if renting, you will get a bill from the rental company to pay the toll); you can also sign up for a temporary Good to Go pass: wsdot.wa.gov/goodtogo.